FTX Logistics Instructor, Jason McQuinn is taking part in this year’s Banger Race to raise funds for SSAFA. 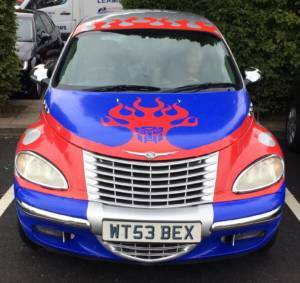 The theme is Superheroes so Jay’s car is going as Optimus Prime and hoping he will make it all the way to Zagreb in September. All costs and expenses are paid for personally by the Teams so all donations go straight to the Charity. Colleague support last year was greatly received and any support this year will be very much appreciated. Click here to donate on Jason’s Just Giving page.